I'm so tired right now that I couldn't BEGIN to think about typing a real post. So I'll just show a photo. Well, more than a photo, really. I made this creation in Photoshop out of a photo I took of my African Grey, Reno. It makes him look like he's coming out of the photo, eh? It's a wonderful tutorial. I say this because it assumes you know almost nothing about Photoshop and supplies screen shots for every move. My kinda tut there! Easy peasy! Okay, now I'm off to dream land. Night all! Most of the day I spent with my leg propped up due to being in an RA flare up, but I did have some fun. I'm only gonna talk about good stuff....why dwell on the negative, right? Right! There's never a dull moment when you have pets. 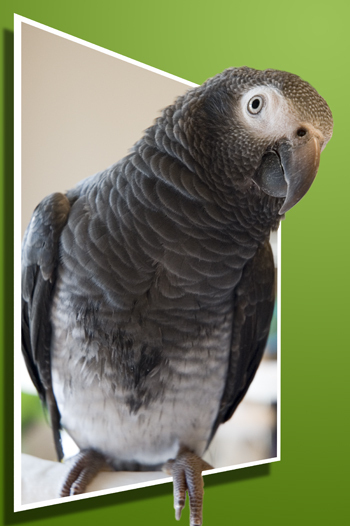 Especially when those "pets" (they think they're human and KNOW they're a part of the family) are parrots! Vegas amazes me with her intelligence every single day. Today she showed me, Joel, and Kolby that she not only learns from us, but from the other fids (feathered kids) as well. I taught Reno how to say Mama. Well, he picked it up after me only saying it twice. The only thing was, it came out sounding like a robot said it. LOL Vegas said Mama long ago, but now she's also saying it like Reno says it. Maui was pretty hilarious today, too. That's nothing new, though. I can't leave the room for a second without that little stinker hopping down and following me wherever I'm going. LOL Seriously, he does this EVERY time I get out of his sight for even a second...no joke! He sees no reason why he can't go where Mommy goes. And I can't forget about my silliest little feathered child, Rambo. *laughing* I swear this little guy should be called Romeo rather than Rambo. He's such a sweety...but he's a bit of a con artist, too. He'll say anything to get out of his cage. It always works unless I absolutely can't get him out at the time. He will tell me he loves me as I put him up for bed at night, or when I'm about to go somewhere. It's very sweet until you have to turn the light out and leave him behind saying "I love you" over and over in the softest little voice. It breaks my heart to put him in his cage when he's being so darn sweet!